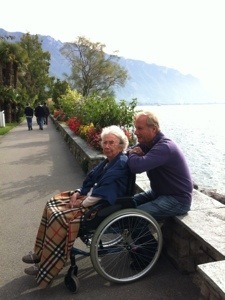 G and I just made a quick trip to Montreux to visit his mother, who is almost 90 and somehow looks better every time we see her. 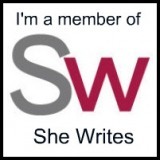 It must be the Swiss scenery – and taking daily walks along Lac Leman – or maybe the food – Filet du Perche from said lake – or else it’s the schnapps. Yeah, I’m going with the schnapps. You can buy just about any flavor of it in the little shop near where she lives. I love walking along the lakeside. It’s so peaceful and there are always beautiful flowers and interesting displays along the way. 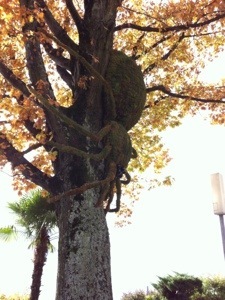 This time, probably because of Halloween, there was a huge spider in a tree. I didn’t know the Swiss celebrated Halloween. The weather was beautiful. 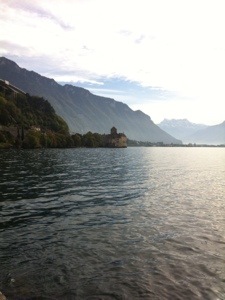 We almost walked all the way to Chateau de Chillon, which is one of the most visited sites in Switzerland. 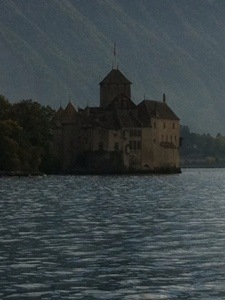 It is a castle carved out of stone on the lakeside. Perhaps it’s best known for Byron’s poem, The Prisoner of Chillon. The poet even carved his name on the column in the dungeon where he believed the prisoner was chained. I always think of Deep Purple’s song, Smoke on the Water, when I’m here. It was written about the fire in Montreux’s Casino. We usually stay near there (it’s been rebuilt) and when I look out over the lake I can just imagine what it looked like, with flames licking at the sky and smoke billowing out across the water. 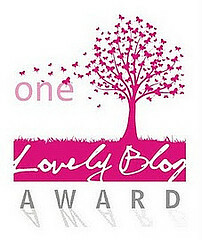 Funny thing, that was the first song I learned to play on the guitar! When G and I get old, I can just see us here, taking daily walks along the lake. Maybe stopping for a schnapps and drinking a toast to his mom. 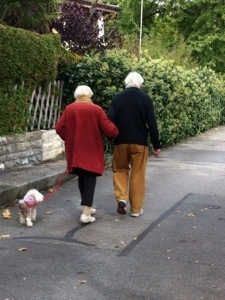 This could be us in 30 years! I think that’s the song everyone learns first. That, or House of the Rising Sun! Looks like fun.